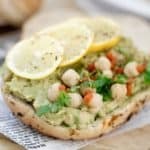 A delicious veggie packed toast made with a whole grain bagel and packed with fiber and protein from chickpeas! Perfect for a snack or main meal! In a small bowl, mash chickpeas using the backside of a fork for about 1 minute, or until a coarse puree is reached. Add in the avocado and continue to mash together with the beans until smooth. Stir in the lemon juice, garlic powder, salt and pepper. Top each half of toasted Dave's Killer Bread Epic Everything bagel with half the mashed chickpea avocado spread. Garnish with sriracha if desired. Note: If I’m having this as a snack, I’ll have one slice with a big cup of water. For a meal, I’ll pair half with a salad, or, eat the whole thing if I’m super hungry!